The outstanding mystery of OB emission line stars is their variable mass loss. Although the combined effects of radiation and rotation can explain the existence of the steady-state winds, some activity of the underlying star seems to be required to account for the variability. Possibilities include several kinds of small-scale atmospheric structure, such as nonradial pulsations (Gies 1994), flarelike events (Smith et al. 1994), and variable extended photospheres (Hirata 1995). Since the outflow of material creates extended atmospheres in the form of rotationally flattened circumstellar envelopes and asymmetrical winds, in which the starlight is polarized by electron scattering, polarization is an effective probe of the mass loss process. The choice of a broadband filter system for the original monitoring program was to extend the time base of continuous systematic observations for the study of long-term variability, taking advantage of earlier work which dates back to the broadband polarimetry of the 1950s. The variety of time scales (hours to decades) and the unpredictability of the mass loss variations makes it difficult to collect well-sampled data within the usual scheduling constraints at major observatories, so after 10 years at McDonald Observatory the observing program was transferred to Limber Observatory, a private observatory in the Texas Hill Country near San Antonio. Recent advancements in the instrumentation available on the open market have made this possible without compromising the quality of the data. 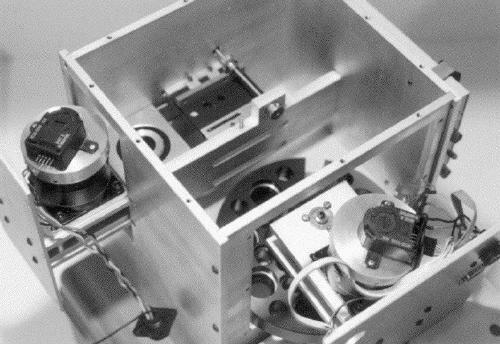 As an added benefit, a modern small telescope and polarimeter with a V filter is all that is needed for routine monitoring, so that observing time on large telescopes with spectropolarimeters can be put to better use. AnyPol (McDavid 1999) gets its name from the fact that it is completely generic and incorporates no new principles of design or construction. 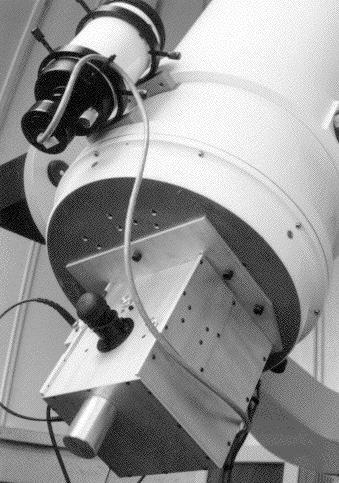 In most respects it is a simplified and miniaturized version of the McDonald Observatory polarimeter (Breger 1979), using a rapidly rotating Glan-Taylor prism as an analyzer, followed by a Lyot depolarizer, Johnson/Cousins UBVRI glass filters, a dark slide, a Fabry lens, and a Hamamatsu R1878 S-20 photomultiplier tube. It is very compact, with stepper motors and belt drives for separate analyzer and filter wheel modules which fit into a single main head unit. A simple postviewer using a right-angle prism at one position of the filter wheel is adequate for finding and centering, and three aperture sizes are available in a slide mechanism with a pair of LEDs for backlighting. The control system for AnyPol is based on a 66MHz 486 PC with plugin multichannel analyzer and stepper motor controller cards, interfaced to the polarimeter head through an electronics chassis unit containing the power supplies and microstepping drivers. A point-and-click display serves to control all selectable functions and parameters and also shows 10 second updates of the measurement in progress, including a graph of the data buffer. The mathematical details of the data acquisition and reduction were adapted from the control program for the Minipol polarimeter of the University of Arizona (Frecker and Serkowski 1976). Regular observations with AnyPol began at Limber Observatory in the fall of 1994. Comparison of the new Limber data with the earlier McDonald data demonstrates a good agreement between the two systems. Observations of unpolarized standard stars show an instrumental polarization on the order of 0.10%, and observations of polarized standard stars match the standard values with uncertainties on the order of 0.05% and 2°. I am very grateful to Michel Breger and Santiago Tapia for introducing me to the basics of astronomical polarimetry. I also thank Paul Krueger for his skillful machine work in transforming AnyPol from line drawings on paper into the reality of metal. Breger M., 1979, ApJ 233, 97. Frecker J. E., Serkowski K., 1976, Appl. Optics 15, 605. Gies D. R., 1994, in Pulsation, Rotation and Mass Loss in Early-Type Stars, L. A. Balona et al. (eds. ), Dordrecht, p. 89. Hirata R., 1995, PASJ 47, 195. McDavid, D., 1999, PASP 111, 494. Smith M., Hubeny I., Lanz T., Meylan T., 1994, ApJ 432, 392.